Program Director Bill Turner and members of Portsmouth Ambulance meet with EMT course scholarship and loan recipients. Pictured L to R: Turner, Charles Crisp Jr., Dekote Ricketts, Fred Teurman, Natassia Barry, James Craft, Michael SanchezAthinna Williams, Natosha Blanton, Bethany Councillor, Brian Estep, Rachael Estep and Mike Adkins. 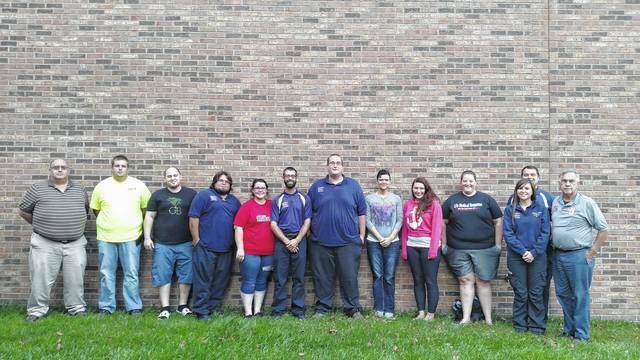 In order to combat the shortage of emergency medical service (EMS) staff, Portsmouth Ambulance offered seven scholarships of $700 each plus books for individuals going into the emergency medical technician (EMT) program at Shawnee State University (SSU). Additionally, they offered three interest free loans for current Portsmouth Ambulance employees willing to take the course to advance their careers. Estep explained that the program is not only a way to encourage people to consider careers in the EMS field, but is also a way to partner with SSU. Michael Adkins, owner of Portsmouth Ambulance, is a graduate of the first paramedic course to be offered at SSU. Estep is also a graduate of SSU. She explained that the university has a high pass rate on the national certification testing. Estep also added that EMTs are in such need that finding a job is far from difficult. Bill Turner, who is over the EMS program at SSU explained that the EMT course is a prerequisite for the paramedic course. He added that he currently has 26 EMT students and 24 students in the paramedic course. Turner explained that he would like to see the courses bring in more than 20 students consistently. “We’ve got plenty of room for people,” he commented. Additionally, Turner stated that the pass rate on state licensure testing is very good for both EMTs and paramedics, attesting to the academic standards of the courses. “This paramedic program is one of the oldest and continually operated in the State of Ohio,” Turner said. Both programs are also state and nationally accredited. Scholarship recipients included Charles Crisp Jr., Dekote Ricketts, Fred Teurman, Athinna Williams, Natosha Blanton and Bethany Councillor. The three Portsmouth Ambulance employees to receive interest free loans included Natassia Barry, James Craft and Michael Sanchez. For more information about the EMS courses at SSU, contact Bill Turner at 740-351-3463.
https://www.portsmouth-dailytimes.com/wp-content/uploads/sites/28/2017/09/web1_IMG_20170914_175727746.jpgProgram Director Bill Turner and members of Portsmouth Ambulance meet with EMT course scholarship and loan recipients. Pictured L to R: Turner, Charles Crisp Jr., Dekote Ricketts, Fred Teurman, Natassia Barry, James Craft, Michael SanchezAthinna Williams, Natosha Blanton, Bethany Councillor, Brian Estep, Rachael Estep and Mike Adkins.